Time: 5:30pm - 9:30 p.m. This year was even better than last year (our first year participating in NDEW). We had a preview event the weekend before DEW (sat and sun) at a very popular and upscale flea market. The first weekend of DEW we participated in a parade in Louisville and had a ride and drive in Lexington. At the ride and drive we had the UK solar car team bring their solar car (which was a real hit). We even had the solar car race a Tesla, which was a real crowd pleaser. Of course, you know who won! 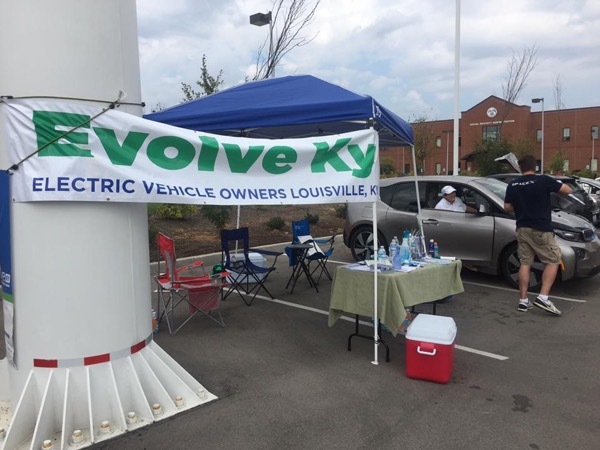 And, the last weekend we had a ride and drive event in Louisville that was well attended and our EV movie night after, where we viewed Who Killed the Electric Car. It was interesting to watch that movie again in the light of all that is going on in the EV community both nationally and locally. We are making great strides! Ride and Drive: 5:30 - 7:15 p.m. Movie: 7:30 p.m.
Bring your family and friends to our second annual EV Movie Night hosted by Sullivan University. Start with viewing a variety of electric vehicles in the Sullivan University parking lot and even experience first hand how fun these cars are to ride in. Then, see the classic documentary Who Killed the Electric Car on the big screen while enjoying popcorn and drinks. Event is free and open to the public.